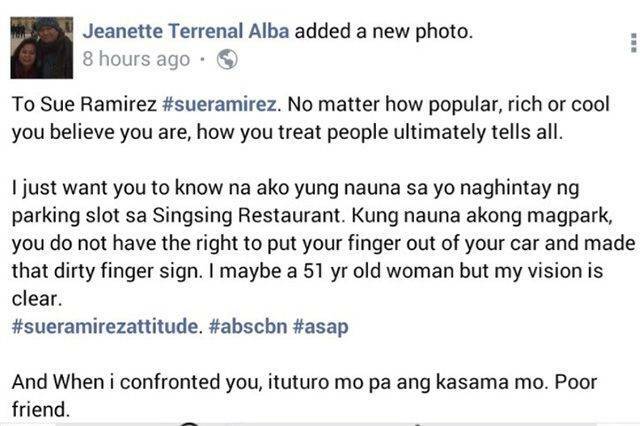 Kapamilya actress Sue Ramirez was the recent viral topic on the interwebz when 51-year-old Jeanette Terrenal Alba called her out on Facebook for flipping her middle finger in the heat of an alleged parking incident. The confrontation occurred in the parking lot of a restaurant when Sue and Jeanette were both eyeing the same slot. Jeanette then tagged the actress in a public Facebook post where she recounted the incident. The status has since been taken down. But all's well that ends well as Jeanette posted that she received an apology from the young actress and that she considers the issue closed. Sue also took to Twitter to appeal to fans to know the "real story" before believing what they read.